I didn’t know Mike Levine, the editor of a newspaper in Upstate New York whose big heart gave out over the weekend at the untimely age of 54. But it sounds like he was a great guy. So, I can understand how his shocked and bereaved colleagues were determined to pay him a heartfelt tribute in the pages of their paper, the Times Herald-Record in Middletown, NY. 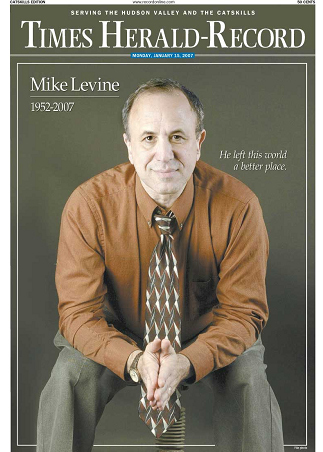 Not only did they turn page one of Monday’s paper into a full-size poster of Mike, but they also devoted most of pages 2, 3, 4, 5, 16 and 17 to articles about or by him. The paper’s web site was packed with even more stories, photos, videos and remembrances. Although the extensive coverage is tastefully and sincerely presented, it raises the question of whether the staff, in its grief, lost its sense of proportion. As fine a husband, father, journalist and friend as Mike was, did his passing rate exponentially more ink than the death of any other member of his community? In giving one of their own a bigger send-off than likely would be accorded a mayor, plumber, homemaker, shopkeeper or schoolteacher, is the newspaper subliminally saying that the lives and deeds of journalists are more important than those of lesser mortals? Is that the elitist message journalists want to send while newspapers are suffering historic declines in confidence and patronage? A sense of proportion in news coverage is increasingly rare in these days of YouTubed hangings, fulminating blogs and frothing cable commentators. Newspapers are unique among all the media, in that they have the time and resources to report, evaluate and thoughtfully present the news. They, and we, can’t afford for them to lose their grip when times get tough. I'm sorry, but you don't really know what you are writing about. Mike was a Brooklyn boy who grew up with the Times Herald-Record, who made it his own, who wrote thrice-weekly columns, who visited the people he wrote about, who transported people to the legislature so they could help fight battles for others like themselves. There were more than 34 pages of letters of condolences in his obituary guest book, numerous columns written in sorrow, people e-mailing each other all over the country, friends in shock. Not only did he adopt Orange County, Orange County adopted him. only hope to set such an example for news executives, reporters, and columnists as he has. inadequate or angry at life. I am deeply sorry to have upset you, Judy. In fact, I was so concerned about the possibility of offending someone that I almost didn't post the piece. But I decided there was value, from a journalistic point of view, in questioning the extent of the coverage of Mike's death in his newspaper. My reasons are spelled out in the post and I hope you will find them self-evident upon further reflection. My comments weren't intended to - and, in fact, do not - take anything away from Mike's extraordinary life and significant personal and professional achievements. Still, I am sorry to have added to your grief. This was anything but what I intended.